Let me start by saying I'm an advanced beginner guitarist at best and I really love playing. but for some reson I have had about 25 guitars already the best ones being a 2014 gibson LP studio pro , and my current ones a Martin gpcpa4, and a Gretsch electromatic 2155. and had a bunch of crappy ones also. Any way I just got 4 more today although these all need work which is why I'm here. I'm barely up to attempting a neck adjustment, never mind repairing a body... so If you all would be so kind to let me know if I'm on the right track here. 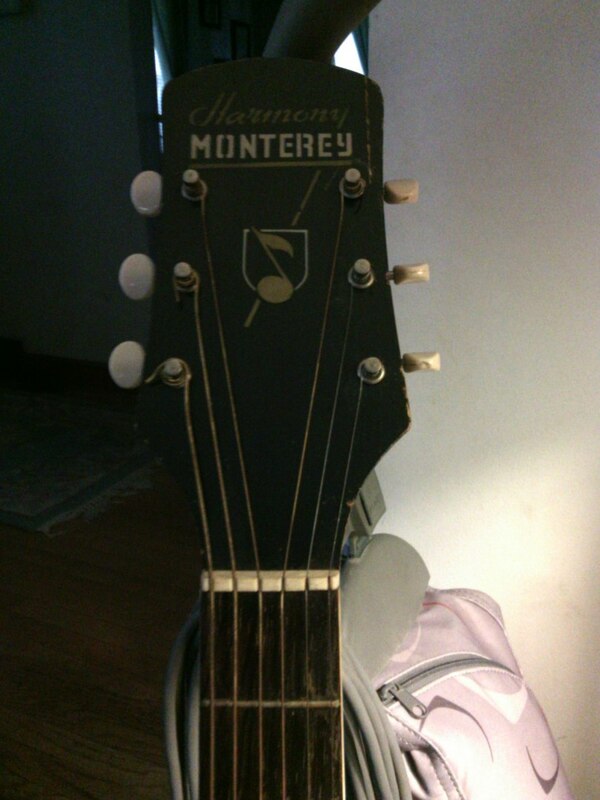 Today I got a Harmony Monterey hollow body prob 60's, Two Teisco tulip style guitars and a Regent 12 string acoustic. 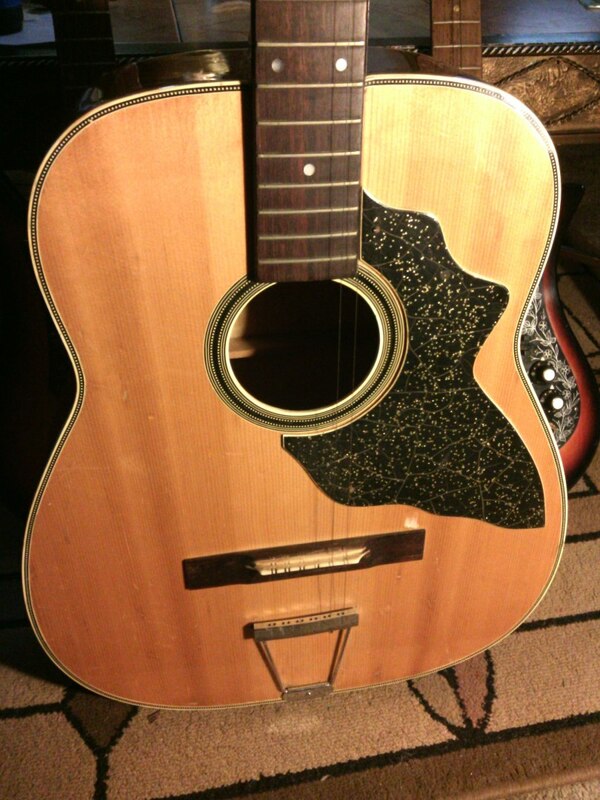 I like the looks of the Harmony but the back is coming off and the binding is missing a piece. 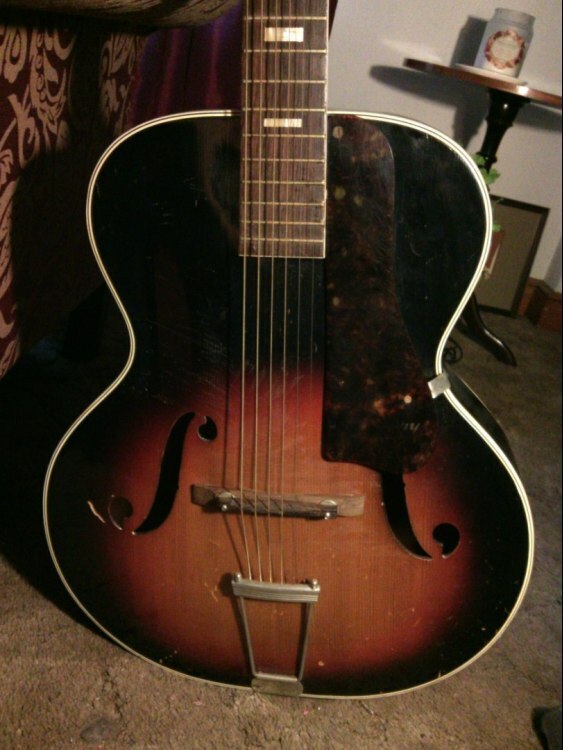 Is it worth fixing possibly restoring? Can i do it myself (is the cost of tool ratio to value of the guitar i would have in the end worth it)? 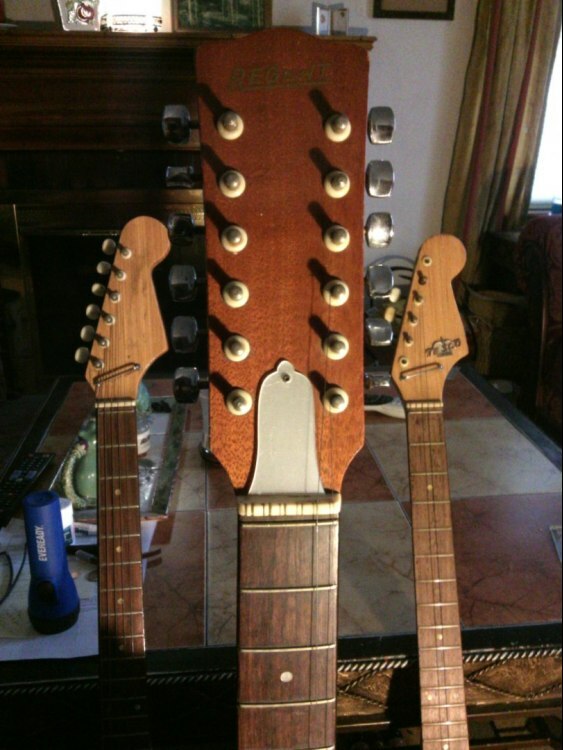 do you think a luthier would trade the repair for the other 3 guitars? I' have no attachment to any of them so ultimately if I don't loose anything on them i'm good . but if i could come out with a nice guitar thats cool and if i can make money thats better. Im into these for about $200. if that makes any difference. 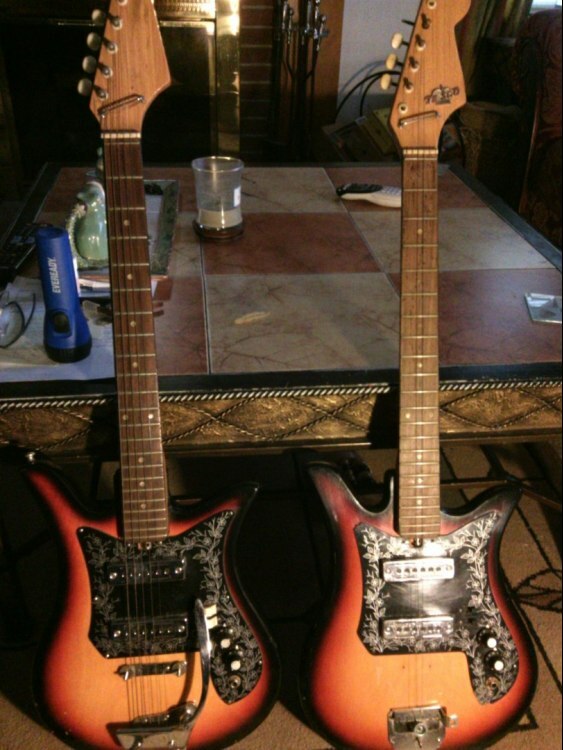 I also thought maybe fix the one teisco looks like missing the bridge piece and needs gone thru but Im not really interested in it or the 12 string so I think ultimately I want to know , the best way to make money on these guitars vs maybe having a decent hollow body when repaired or your ideas??? For the binding repair it's not bad; especially if not doing a refinish, Look up acetone wipe binding installation. Go read it thoroughly, but the general gist is wipe acetone on the binding's inside edges, tape in place, let dry. Do the same for the missing section after you've cut a new matching piece to size and trimmed everything so it's a tight fit. If you're ok with doing a little filler work if your fit isn't perfect you can make a slurry of plastic binding shavings and acetone too. 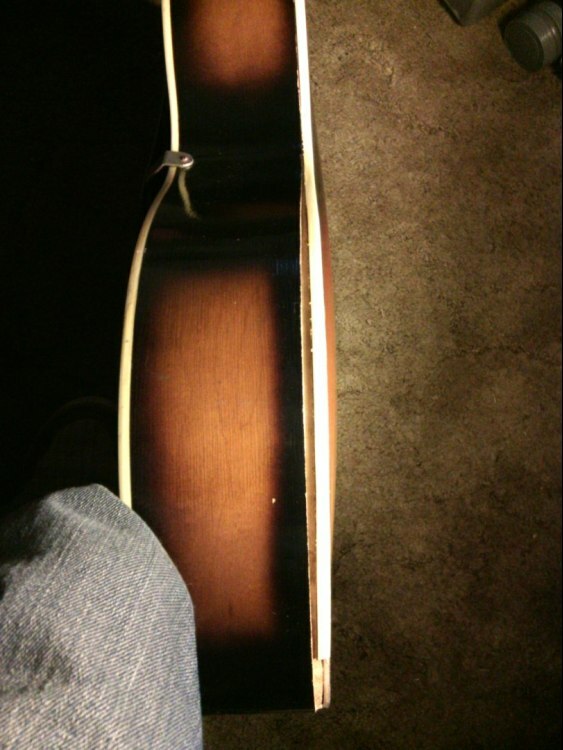 Just work on the guitar, get it right, and then see where you are. I think it's a mistake to wade into this stuff looking for a dollar angle. It's a good way to get discouraged. But if you wade into it looking for a way to build your chops, whether playing or building / repairing, you will succeed. Somewhere along the line it might even stop costing you way too much money, and at least in theory, some time after that you might find yourself money ahead. 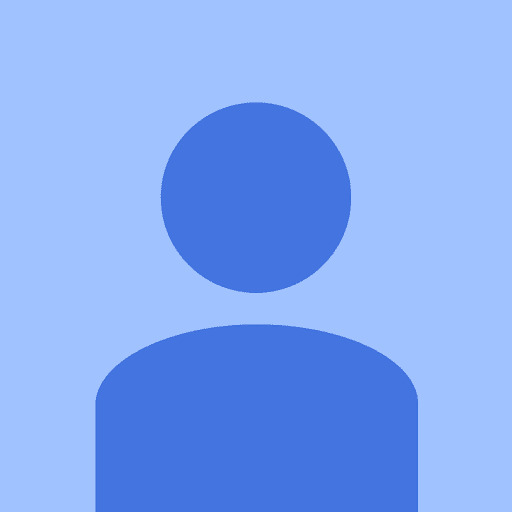 Thanks for sharing the post. Truly enjoyed the pics.